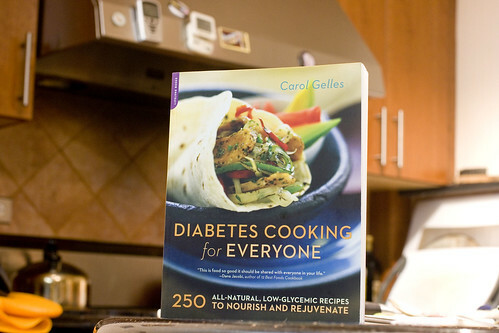 I’ve been asked to review a cookbook, Diabetes Cooking for Everyone, by my friend and mentor, Carol Gelles. To do that, I need to select three recipes and try them but I’m having a hard time narrowing down which 3, so I need your help. I’ll be posting the recipe with pictures and my thoughts on the the three that are selected. posted by jessica	at 09:18 AM	Filed under Reader's Choice. You can follow any responses to this entry through the RSS 2.0 feed. Both comments and pings are currently closed. Jessica, looks like Chicken en Brochette is leading the pack, and I’d love to try that myself; I can’t wait to see what you’ll do. Well, I took some time away from blogging, and it looks like I have a heck of a lot of catching up to do, but that’s never stopped me before. My mother’s diabetic, so this cookbook sounds interesting! I look forward to the reviews. Jackie and Marysol, looks like both of your picks are still leading! i would go for the chicken, pear, and beets because since fruits’ nature sugar is very tricky with diabetic people. I voted! Oooh, looks like some close calls! Can’t wait to see which recipes you test. When I saw this post, I was drawn to it. My dad is diabetic. I would like to make one of the dishes you prepare. Can’t wait!